From the Sunset to Potrero Hill, the Financial District to Richmond, the many unique neighborhoods of San Francisco offer a wide variety of opportunities for you to enjoy cultural, recreational and social activities. Home to communities like Pacific Heights, North Beach, Noe Valley, Cow Hollow, Haight-Ashbury, the Fillmore District, Hayes Valley, Bayview, Castro and SoMA, the vibrant and beautiful city of San Francisco is a wonderful place to live, work, and play. Take a stroll around Chinatown, Yerba Buena and Japantown, hike the trails of Glen Park and Cole Valley, relax at the beach on Treasure Island, or play in the parks surrounding Duboce Triangle and Castro. Whether you enjoy attending theatre performances in Union Square or Central Market, taking in the beautiful architecture and expansive views of Nob Hill and Pacific Heights, or dining in the Mission District, Sunset, Embarcadero, Marina or Noe Valley, you’ll want to take advantage of all the experiences San Francisco has to offer you and your family. When your days are full, and you wish you had more free time, Aunt Ann’s In-House Staffing can help you attain a fulfilling, balanced lifestyle by pairing you with exceptional domestic and childcare personnel. 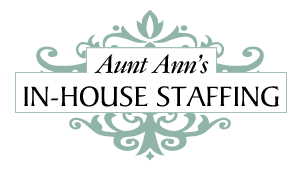 Aunt Ann’s In-House Staffing has amassed over 60 years of making successful matches between the personalities and staffing needs of San Francisco households and the characteristics and employment backgrounds of professional, highly skilled nannies, housekeepers, estate managers, private chefs, personal assistants and more. For over three generations, our family-owned business has earned the trust and loyalty of both employers and domestic professionals. That’s why we are called upon year after year by established San Francisco clients as their needs for domestic help expand. We understand how important it is to find reliable, trustworthy staff to care for your home and family. Whether you need a housekeeper, nanny, personal chef, or other domestic staff, Aunt Ann’s presents only the most professional, caring, and skilled candidates are to you for consideration. We’ve successfully matched nannies with families in neighborhoods like Pacific Heights and Nob Hill, and our placements consistently have earned us 5-star reviews and personal recommendations. From Marina to Glen Park, our experienced, diligent and discreet housekeepers, estate managers, personal assistants, and private chefs are happily working in homes throughout San Francisco. You want your children to have consistent, loving care when you can’t be with them yourself. That’s why Aunt Ann’s In-House Staffing carefully screen all of our nanny applicants and introduce you to only the most experienced, reliable and nurturing San Francisco area nannies whose child-rearing ideologies mirror your own. All of our nannies have between two and five years of childcare experience (including at least one year in a private residence), are CPR and First Aid certified, and are Trustline registered. Furthermore, Aunt Ann’s nanny services will assess your family’s characteristics and childcare needs, and we will match you with your ideal childcare professional, whether you need a full-time nanny, live-in nanny, newborn nanny (baby nurse), family assistant or parent’s helper. We’re also the most trusted source of experienced, professional on-call nannies and babysitters in San Francisco. San Francisco parents have depended on Aunt Ann’s to provide their children with highest-quality nanny care for over 30 years. From managing dinner parties to meeting dietary needs, a private chef can make a tremendous positive impact on your life in San Francisco by providing you and your family with healthy meals each day and allowing you more free time in your otherwise busy schedule. Aunt Ann’s will expertly match you with an experienced private chef who will eliminate the need for you to spend time meal planning, grocery shopping, cooking, serving and cleaning up after meals. Each of our private chef applicants has two to five years of experience as a personal chef in a private home, and most have been formally trained at a culinary institution. All of Aunt Ann’s private chef applicants have professional references and have demonstrated proficiency in understanding their employers’ dietary preferences and adapting their meal plans accordingly. And, if you need a private chef who can travel with you or who is experienced in managing kitchen staff, we can find a private chef with those qualifications. Aunt Ann’s In-House Staffing has been successfully matching private chefs with San Francisco families for generations, and we can do the same for you! A personal assistant can streamline your busy home life in San Francisco by keeping track of your schedule, organizing your days, and taking care of all the tedious tasks that prevent you from accomplishing other things. The responsibilities of a personal assistant can include taking on the role of social secretary, administrative manager, travel planner, human resource manager and event planner. All of Aunt Ann’s personal assistants are organizational, etiquette and protocol experts who possess excellent computer and communication skills and are proficient in maintaining social calendars and managing correspondence. Our San Francisco clients know they can count on Aunt Ann’s In-House Staffing to match them with exceptional personal assistants who are quickly able to anticipate their daily needs. Managing your estate and its staff is a full-time endeavor that requires exceptional organizational and leadership skills. Aunt Ann’s In-House Staffing has access to the most skilled and experienced estate managers in San Francisco. Each of our estate manager candidates possesses extraordinary administrative, human resource, computer, security and household management skills and has a proven track record in the management of multiple properties, acquisition and negotiation, contract drafting and appeasement, budget planning, and construction and renovation projects. We will match you with reliable, professional estate manager applicants who are an ideal fit for your personality and lifestyle. We’re Happy to Discuss Your Staffing Needs! Learn more about our San Francisco household and nanny staffing services by giving us a call at 415-749-3650 and put our 60 years of successful staff placements to work for your family.